On the opening day of the EXPO 2012 Yeosu, Korea H.H. Sheikh Abdullah bin Zayed Al Nahyan, Minister of Foreign Affairs and Chairman of the National Media Council stated that the UAE believes International and World Expos play an important role in bringing nations together and fostering understanding, cooperation and development. The theme of EXPO 2012 is particularly relevant to the UAE. Another important occasion prior to the opening of the UAE Pavilion at EXPO 2012 the foreign minister paid special tribute to the organisers of EXPO 2012 and the international organising body for holding world Expos, B.I.E. 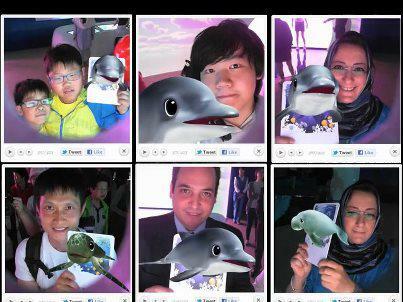 He highly appreciated the theme of EXPO 2012 ‘Living Oceans and Coast’. He highlighted the importance of marine environment in human life by saying that failure to protect our marine resources in all its aspects; we will pay a heavy price. H.H. Sheikh Abdullah bin Zayed Al Nahyan, Minister of Foreign Affairs proudly narrated UAE closed connection with the sea and maritime settlement in the region. “Our forefathers developed the skills to sail, navigate, fish and dive for pearls in local waters and one of the first stages of our modern development, following the formation of the UAE in 1971, was to develop our deep water ports, and to build new ones” he further elaborated. 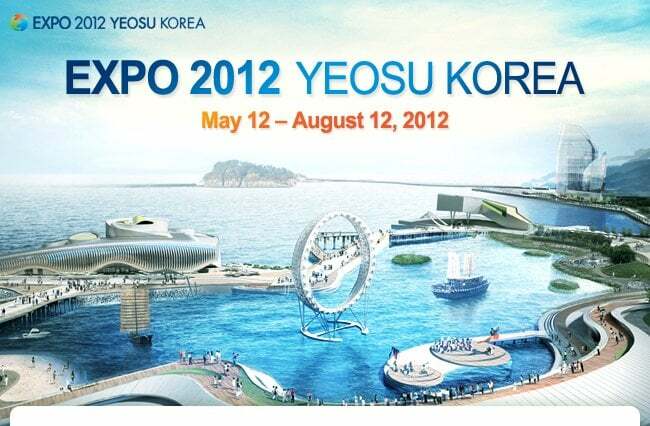 EXPO 2012 Yeosu is currently going on in the Yeosu, South Korea. Culture of expos, exhibitions and fairs has been one of the main attributes of human culture and civilization since from ancient days. It tremendously enhanced shared meanings of social interaction, and developed better understanding about others. It has been one of the main tools of exchanging commodities and communities, hearts and hoards and the last but not the least souls and sources. United Arab Emirates has been famous for its aesthetic culture, rich heritage and openness. It has also been known for its tolerance, interfaith harmony and hospitality. Around the year many regional and international expos, exhibitions and fairs have been arranged throughout the UAE, especially in Abu Dhabi and Dubai. UAE always actively participated in all the famous and mega expos and its marathon representation in Shanghai China 2011 is the prime example of its passion towards developing better cultural understanding and respecting diversity relating to humanity and civility. UAE is actively engaged with international and national programmes, seminars and conferences aimed at curbing carbon emissions and creating more sustainable energy solutions for the future. 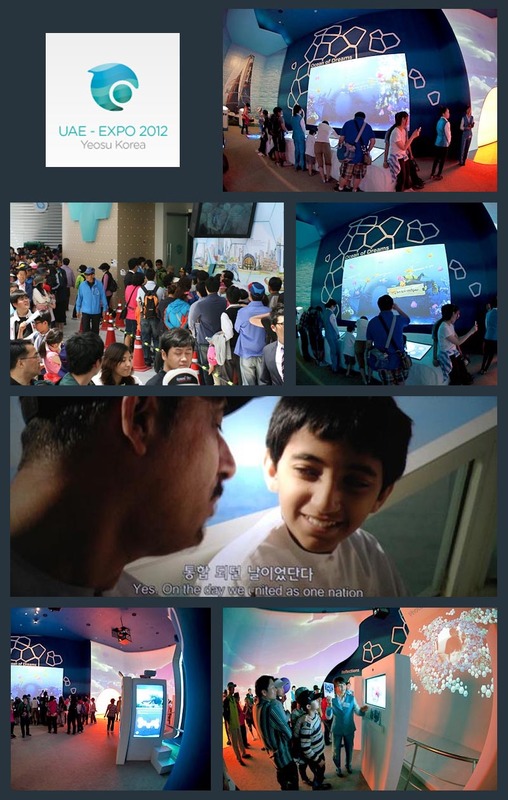 UAE is also deeply involved in ocean related climate change matters such as helping to alleviate the impact of sea level rise and UAE Participation in EXPO 2012 in Yeosu, Korea has already set another grand international stage to “let people and world know” about UAE immense and purposeful efforts in this regard. The International Expo 2012 has been opened on May 12, 2012 in Yeosu, Korea. A total of 104 countries and 10 international organizations, including the United Nations are participating in the 93 day Expo focusing on the theme “Living Oceans and Coasts.” It has succeeded to bring oceans and climate change to the center of international attention. According to the organizing committee the three month Expo 2012 is expected to attract more than 8 million visitors from more than 100 countries around the globe. UAE Ambassador to South Korea Abdullah Khalfan Al Rumaithi opened the UAE Pavilion in the presence of a number of NMC official, organisers of the Pavilion, representatives of the Paris based Bureau of International Expositions (BIE), top Korean officials and Korean and foreign media persons. “The sea is in our blood. Our forefathers were sailors, fishermen, traders and pearl-divers” he added. The UAE is aesthetically engaged in the EXPO 2012 by ‘LIVING SEAS’ as the over-arching theme of its heavily visited pavilion which stands for UAE love, passion, care and perpetual feelings transcended through generations and generations about marine world including seas and oceans whether related with economics, innovation or nature. 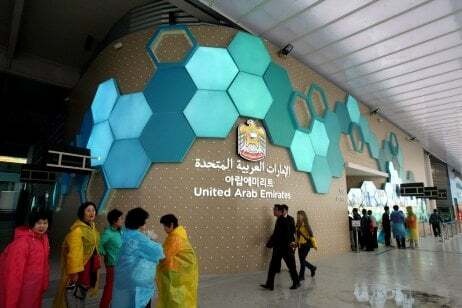 The UAE has won the membership of the higher steering committee of the International Exposition Yeosu Korea 2012 (Expo 2012 Yeosu Korea), becoming the only Arab and Muslim country in the world. Supervised and organised by the National Media Council (NMC), the UAE pavilion at Expo 2012 Yeosu, Korea is arranged into five key areas : The exterior facade featuring a ‘timeline’ and a special greeting, the ‘pre-show’ featuring many interactive presentations, games and documentaries, a ‘sea tunnel’, a themed theatre screening a mini-feature film and the ‘post-show’. UAE Pavilion at Expo 2012 is divided into four distinguished parts namely, Shoreline, Shallow Seas, Oceans and Connections. Each has its unique significance and relevancy with the EXPO 2012 theme. It is all about live experience of nature with full of diversity and convergence. It is journey about knowing of maritime life, species and fishes. It reflects the importance of “Blue Economy” in our daily lives well connected with complicated corporate world of commoditization and massification. The UAE’s marine related economy, surrounding fisheries, industries, trade, tourism and leisure, accounts for a very significant portion of GDP. Archaeological study confirms that for centuries the sea provided a corridor for wide ranging cultural communications and trade, together with essential food supplies and valuable commodities such as pearls. The pattern of human settlement in the land now occupied by the UAE has been one in which the coast has been of prime importance with nearly all the country’s cities situated next to the sea. UAE Pavilion 2012 at the EXPO 2012 is all about acknowledging the importance of seas, coastlines, climate change and its connectivity with UAE people and environment. It speaks highly about UAE maritime heritage, sustainability, coastal planning, marine science, marine conservation and future developments in this regard. UAE Pavilion at EXPO 2012 is exhibiting the positive benefits of planning and conservation efforts as well as the challenges involved in achieving sustainability. UAE pavilion at EXPO 2012 gained immense appreciation among the researchers, marketing gurus, soft image companies and advertisers. The state of the art infrastructure, fixture and environment friendly surrounding won the hearts of the common people and visitors alike. They were mesmerized with UAE museum heritage and splendid display of series of short documentaries about its culture, society, heritage, environment and above all peace-loving people. The UAE Pavilion has become one of the most popular venues. 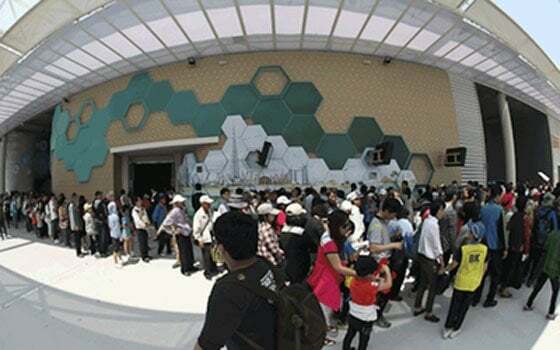 Large queues gathering outside the innovative facade of the building, complete with its graphic ‘time-line’ illustrating key stages in the nation’s development is a daily routine at the EXPO 2012. Video screens showing school children from the UAE displaying their fluency in Korean has created special place in the hearts of the Korean people. 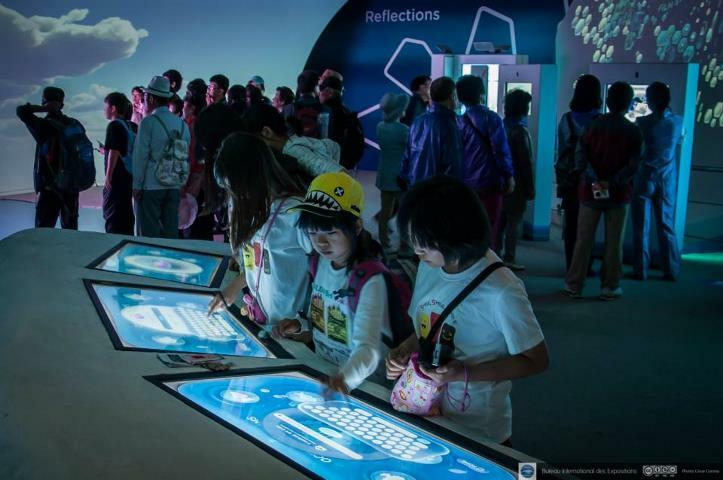 UAE Pavilion at EXPO 2012 provided longer than life opportunities and experiences in which ‘blue space’ meets ‘cyber space’ and where visitors can dispatch their ‘own’ fish to virtual aquaria. Children loved to gather around ‘Ocean of Dreams’ and jumping with great sense of pleasure and joy by setting their own ‘fish with a wish’ free to swim in a large virtual aquarium. Wonderful maritime species and beautiful colored fishes of all types and sizes were wandering in virtual aquaria depicting the incredible assortment situated beneath us. Clownfish and damsel fish became hard favorite among the school going children and high education students. These fishes were named, tagged and connected with lively emotions and feelings of oneness. Photo-Wall facility at UAE Pavilion in Expo 2012 attracted people of all ranks and age was not any bar. They were children, youngsters, girls, married couples and elderly partners. They shared their spirits of togetherness by making snapshots through Photo-Wall digital amazing facility. Unending spells of laughter, smiles, triumph, festivity, and above all collectiveness have been spreading at Photo-Wall facility since the start of EXPO 2012. Entertainment, fun making activities and influx of information are the salient features of the UAE Pavilion 2012. UAE National Media Council’s Pavilion Director, Mr Abdulla Al Aidarous rightly stated that “entertainment is an essential means to engage people with our message”. “We want our visitors to have fun but we also want them to know that we are serious about supporting the EXPO’s call for maintaining the health of our oceans and coastline” he said. UAE is keen to use the event, both as an opportunity to showcase the country’s heritage and achievements within the marine-related sphere and as a platform to share with other countries the UAE’s experiences for preservation of coastal environments in a rapidly developing setting,” he added. UAE Pavilion is demonstrating larger than life characters through different well taken and highly cherished films like “Reflections” that shows how five Emiratis’ lives are intertwined with the sea and “The Turtle saving the Pearl” calling for saving marine turtles and highlights the UAE’s ban on non-biodegradable plastic. 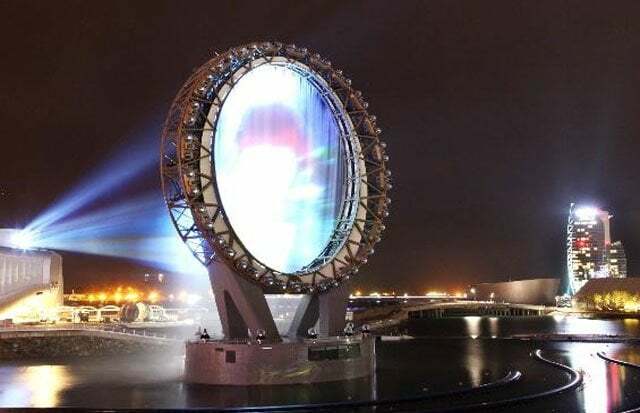 Moreover, the organizers of the UAE Pavilion combined eye-catching entertainment with so many informative videos that reveal the depths of the connections of the Emirati people with the world’s seas and oceans. The gradual set of a large sun, to reveal an open doorway provided the next clue and ‘undersea passageway’, accompanied by shoals of fish and the odd whale, into the ‘ocean theatre are attracted hundreds of thousands people. UAE Pavilion has made big inroads in the hearts of lesser privileged “Blind People” by giving them unforgotten experiences. The organizers have created a tactile and audio-related path primarily for the blind but it can be enjoyed by anyone”. It is all about inner feelings and hearing “Ego of the Heart” experiencing richness and eternal connections of UAE with sea and maritime ecology. They can even listen to audio files on the related topic by touching a hidden object. All the necessary paraphernalia were developed with the support of the Korean Blind Association. Emiratis volunteers at the UAE National Pavilion are very active, cooperative and mainly focused on helping the elderly, orphans, kids and handicapped people. Offering emergency response and the first aid is another avenue of volunteers at work at the 2012. A dozen of UAE volunteers are at work at the UAE Pavilion which is being visited by more than 8,000 people a day on the average. Hoping that their small helping hands dedicated to assisting kids, elderly and disabled adults would present a brilliant image of the UAE to Koreans people. High officials and dignitaries paid rich tribute to UAE Theme “Living Ocean and Coast” delivering true concept of the EXPO 2012. Vicente Gonzales Loscertales, Secretary-General of the Bureau International des Expositions (BIE) and Dr. Rolf Payet, Minister of Environment and Energy of the Republic of Seychelles praised UAE wholeheartedly participation in the EXPO by combining entertainment with eternity journey and fun with fundamental information with maritime life, seas and coastlines etc. 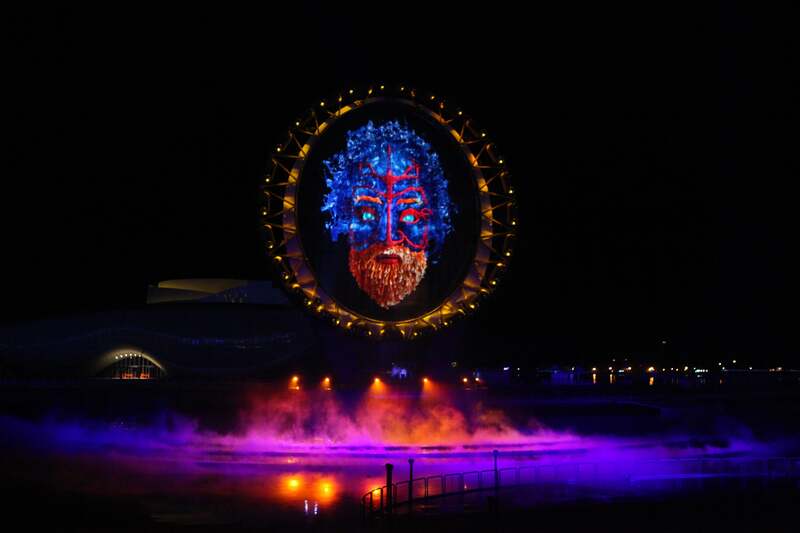 Zhao Zhen’ge, Commissioner General of China’s Pavilion at the 2012 Yeosu Expo has hailed UAE’s participation in the Expo that reflects country’s keenness in preserving environment and marine life. 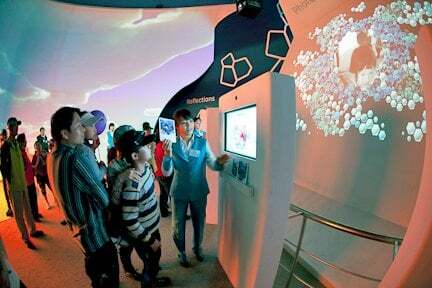 He expressed his admiration for the effective arrangement and interesting scientific material displayed at the pavilion which is spelling out awareness message to maintain the cleanliness of the sea and beaches to help rescue marine organisms. EXPO 2012 Organisers are of the opinion that UAE Pavilion successfully and skillfully covers all aspects of the UAE successful. It also shows UAE efforts, management and development of marine environment and life. They spoke highly about the devoted engagement of the UAE management and supportive role played by the corporate sector budding better understanding, conserving and developing of the marine environment.